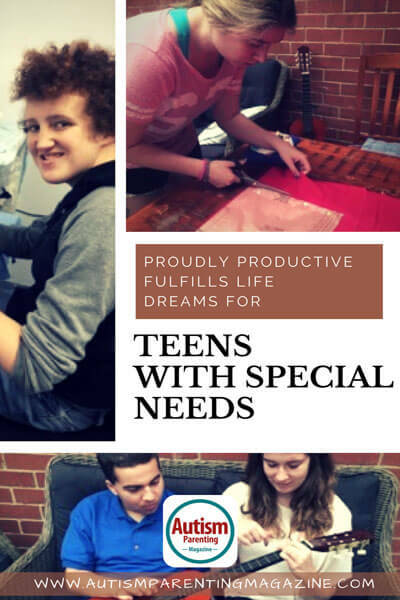 While working with teenagers with special needs as an education assistant in a Perth, Australia high school, I would often listen to the kids and their parents talk about the hopes and dreams they had when they finished year 12. Many of these students, some of them with autism, suffered from anxiety and would voice their concerns about trying to choose the most appropriate and relevant post school options. The need for new opportunities was very evident. I had started a small craft group during lunch times teaching needle felting and quickly realized the students were talented enough to eventually sell what they made. Felting is a creative craft which is tactile and I noticed the longer the students crafted with wool, the calmer and more focused they became. It seemed to satisfy the sensory needs of the students. I really wanted to introduce other crafts to our lunchtime group, but lunchtime was just not long enough, and we just never had time during the day with the students attending their classes. Although the school had an enterprise subject, I found the activities organized such as candle making were enjoyed, but the students would not be able to do activities such as this without a lot of help once they left school. I really wanted the students to be able to achieve success without having to always rely on someone to help them. With needle felting they would be able to take a small bag along with them with a piece of foam, a needle, and some wool roving and make a little gnome or animal anywhere, anytime. My vision was that these students could eventually have their own boutique business someday, either an online Facebook Shop or regular market stall. And that’s when Proudly Productive was born. This small business, located in Booragoon, gives young people with special needs work. We have many other activities such as up-cycling furniture, sewing-flag bunting, throw rugs that fold up into a cushion and selling pre-loved items. I also saw first-hand the calming effect manual arts like woodworking was having on students when they were in an adult environment—and they loved it. I was finally inspired to make the move to open my own studio by former Seton Catholic College students Julian Gaglia and Ella Coombes, both of whom are kids on the autism spectrum whose anxiety and agitation are soothed markedly when they are busy doing craft or furniture restoration work. Proudly Productive is meant to replicate a workplace as closely as possible, so clients learn the employment skills they will require to someday move into paid employment. Along with the craft skills, they take turns serving in the shop, operating the cash register, counting the float, clean windows, vacuum, and many more skills they may require when employed. We cater to individual needs, ability and concentration levels. I have made up many visual aids to help the clients practice their skills and achieve success. Although Proudly Productive has a retail shop, we also book stalls at local markets to sell our products. I love the social atmosphere of local markets and think they are the most appropriate place for clients who want to eventually start their own business, grow their social circle, and open the door to their own financial security. Understanding the financial side of buying materials and selling products to make a profit is difficult and some clients may not reach this level of development, but with help, they may find a shop/stall who will sell their products on consignment. Parents who want to book a place at Proudly Productive need to self manage all or part of their child’s NDIS funding to pay the hourly rate for their child to attend. At the moment we are not a registered provider but will be starting the process soon and this will mean more people can easily access funding. We have clients with a wide range of abilities and some clients will not go on to have their own business but attend regularly each week and join in the social atmosphere of our workshop while joining in productive activities that suit their ability. Proudly Productive is not appropriate for everyone because we are a retail store clients need a level of understanding to be able to participate without wandering away. We tell our clients “Proudly Productive is like a factory, it doesn’t matter if you can’t do everything on a project, but you just do the parts you can.” We all work to our strengths. Income from the shop pays for the materials we use such as paint, fabric, wool, and felting needles. We do not pay clients, but profits from the shop are used to go out for morning tea or lunch occasionally. We have a small group who want to visit the local beautician and get a pedicure. They like the idea of sitting in the big comfy chairs with their friends. We cater for young adults from 12-23 years and have a maximum of six clients each day. We have a few limited places for school students to attend workshops during the school holidays. Our website and Facebook page show videos of clients participating in activities. My plan is to open a second shop later this year with different activities and items to sell. I love working with young adults and building their confidence felting is a very tactile craft that is very forgiving when mistakes are made so it has been our most popular activity. I was also getting phone calls from people in the community asking to join our craft workshops. We now have a two-hour craft session each week open to everyone in the community for $30. (conditions apply) I just want to provide a safe, happy social place where young adults can transition from school into the community free from anxiety and pressure. We are very different from the larger sheltered workshops and welcome people to call and book a tour, it is the best way to get a clear understanding of how we operate. Colleen Armstrong has worked with children for 26 years. She started her career after training in childcare and become coordinator of a daycare center In Perth Western Australia. She and her husband have been married for 23 years and they have two children 16 and 18 years old. When they started school, she changed jobs to work as an education assistant in Albany Western Australia. After working in the school environment for a few years in Kindy and Pre-Primary, she was given the job of working with three young boys in a mainstream year 1 class. She did not know a lot about autism at the time and had only attended a few in-service sessions. One of the parents had employed a Social Trainer to attend the school and work with her son. This lady was amazing and she learned a lot watching her. When her family moved to Perth six years ago she started working as an Education Assistant at Seton Catholic College. Proudly Productive took two years to plan and acquire insurances for, now they are growing every week and Colleen hopes to open a second one next year in a different suburb. Colleen Armstrong has worked with children for 26 years. She started her career after training in childcare and become coordinator of a daycare center In Perth Western Australia. She and her husband have been married for 23 years and they have two children 16 and 18 years old. When they started school, she changed jobs to work as an education assistant in Albany Western Australia. After working in the school environment for a few years in Kindy and Pre-Primary, she was given the job of working with three young boys in a mainstream year 1 class. She did not know a lot about autism at the time and had only attended a few in-service sessions. One of the parents had employed a Social Trainer to attend the school and work with her son. This lady was amazing and she learned a lot watching her. When her family moved to Perth six years ago she started working as an Education Assistant at Seton Catholic College. Proudly Productive took two years to plan and acquire insurances for, now they are growing every week and Colleen hopes to open a second one next year in a different suburb.